Introduced this year by club president, Chris Stone, the award goes to the junior player (under 18) who has made the most improvement during the year. According to the nominating committee, Milan embraces the Portishead club’s values of fair play, sportsmanship, camaraderie and support for others, while also working hard to improve his own game. Milan only made his debut for the club last year, playing in the Weston-super-Mare League aged only nine. He even stepped up to perform in the Bristol League Division 7 on occasion. He also represents the club in the Bristol Junior League. Chris Stone, who is entering his 51st competitive season this year, said: “I’m absolutely delighted to be making this award and Milan is an excellent first recipient. He is a good competitor but is unfailingly polite and courteous – taking defeat in the same spirit as when he wins. He has impressed his teammates and his opponents alike. His progress has been remarkable and I believe he could have a big future in the game. Milan, who lives in Portishead, and trains regularly at Gordano School, will retain the cup for a year. 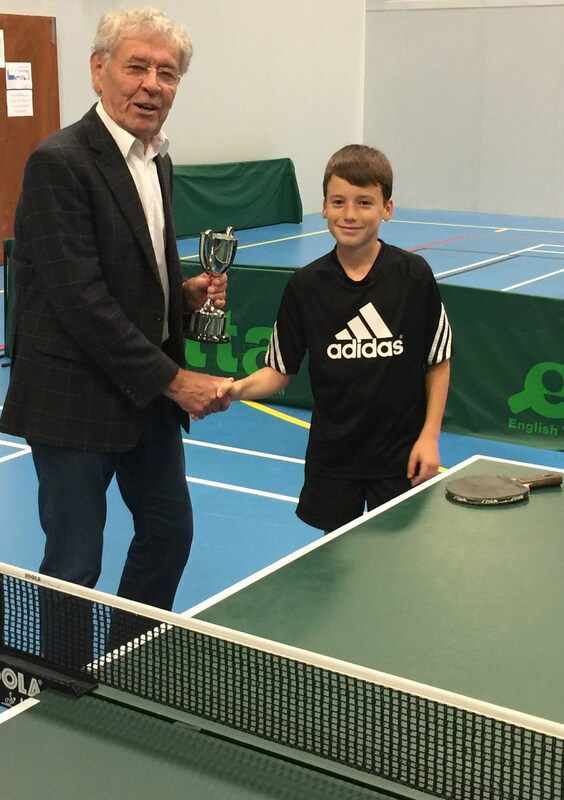 All smiles: Portishead Table Tennis Club president Chris Stone presents his award to Milan Gal.